Back in December, while sailing the magnificently decorated Disney Fantasy, we signed up for one of the most popular beverage seminars, Mixology. The beverage seminars are listed in the daily Personal Navigators, but you must sign up in advance, as space is limited. 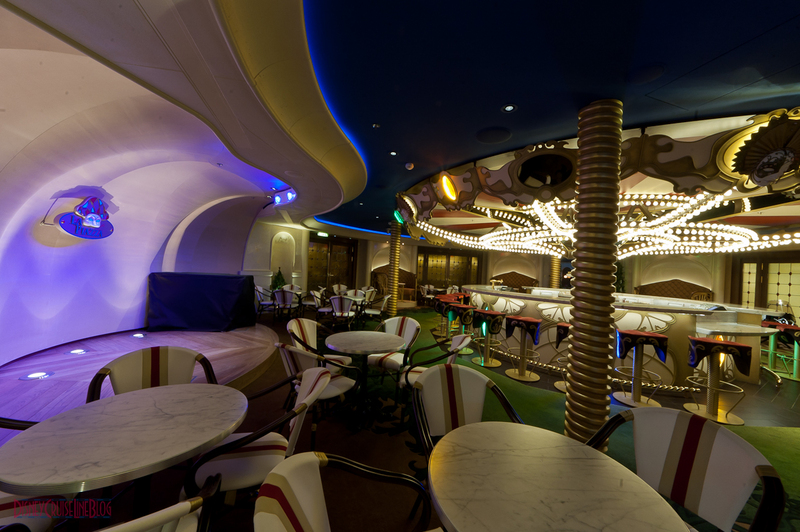 On embarkation day, we stopped by the La Piazza bar in Europa to reserve our spot. 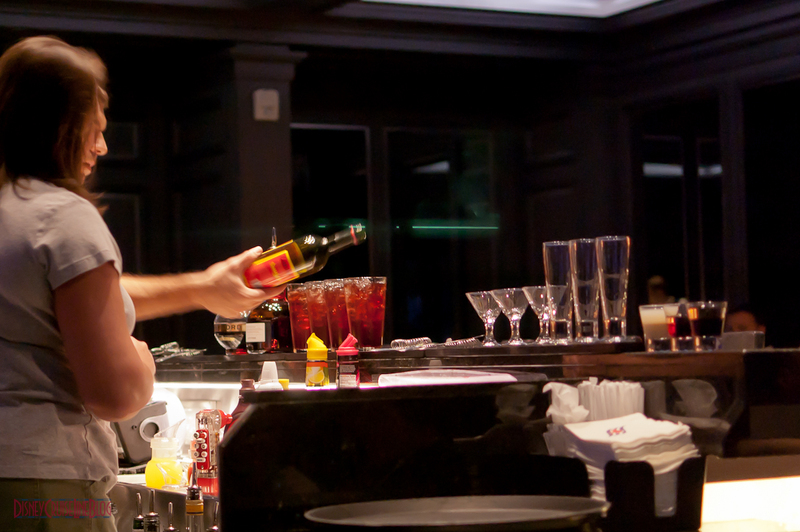 Our Mixology seminar was held in Skyline, which is a must see venue on both the Dream & Fantasy. 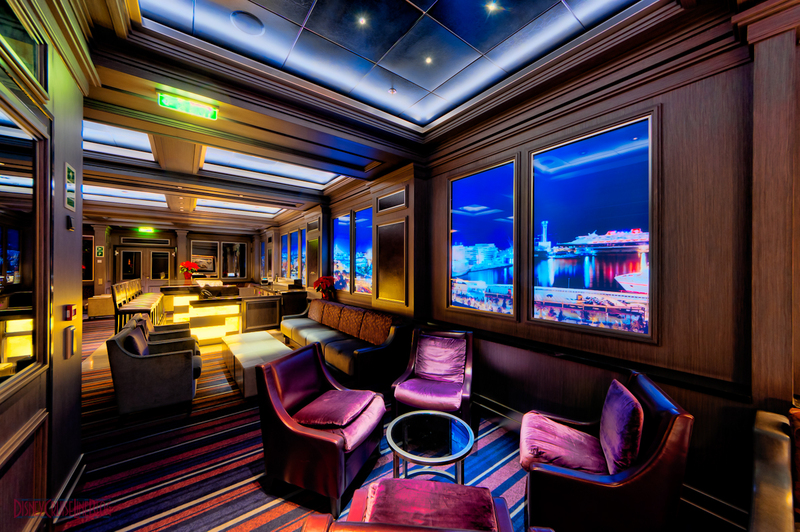 The windows are actually HDTVs synchronized to show a city skyline complete with dynamic elements that really make you feel like you are looking out of a top floor hotel martini bar. Approximately every fifteen minutes the skyline changes to a different international city. I could sit in Skyline for hours looking at all the hidden elements of each city’s digital skyline, but my favorite is Barcelona, Spain. The Barcelona skyline features the Disney Magic in port on the first window you will see when entering through the main entrance doors. 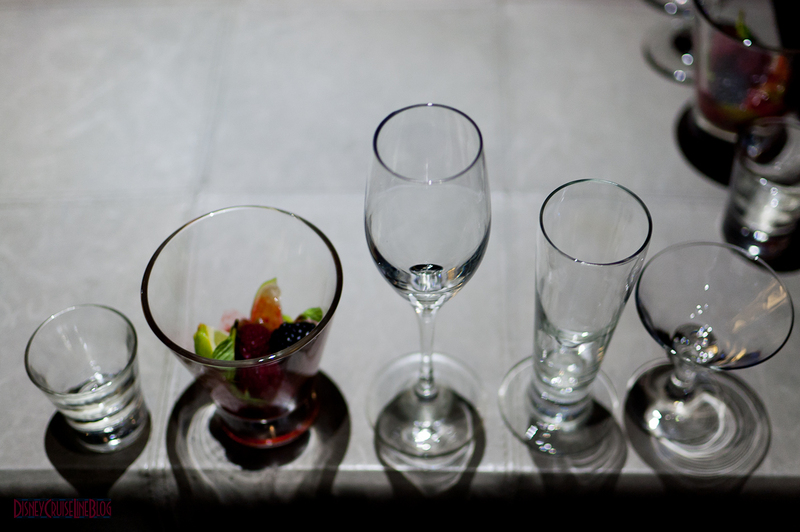 When we arrived for Mixology, there were sets of 5 small glasses set up for each person; they are mini glasses with the exception of the shot glass, which is just a regular shot glass. We took a seat with a couple of friends in the corner to the left of the bar. This location provided a clear view behind the bar. To get things started our bartender, Novak, invited another person behind the bar to assist with the first drink, which was a martini made with Chambord, Grand Marnier, and another few additions…… It was delicious! My wife had 2 of these. This drink was made by Novak and the invited guest, and was poured from a shaker into all of our glasses. 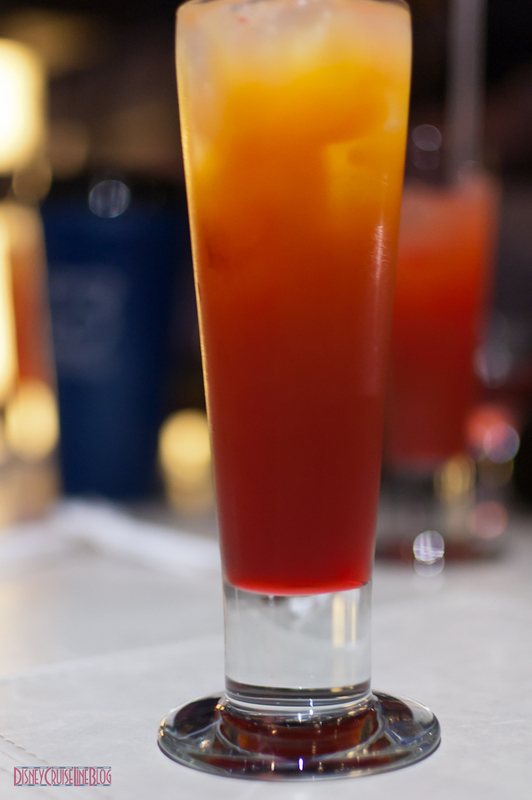 Next up was a Tequila Sunrise. Novak provided some background the tequila and the agave plant. We were given all of the ingredients to make this on our own. 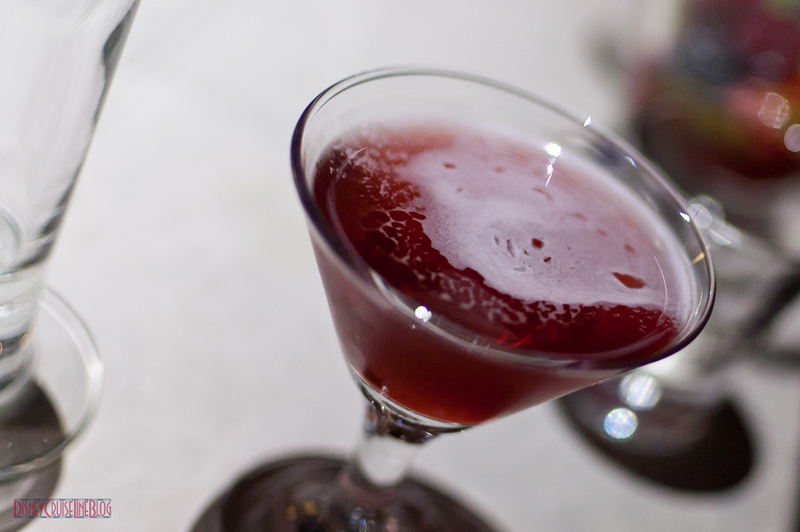 Novak explained about adding grenadine – too much, and it will be way too sweet. Next up was Novak’s “Make your own champagne.” This was the favorite of both my wife and myself. We were given bottles of Prosecco & Licor 43. 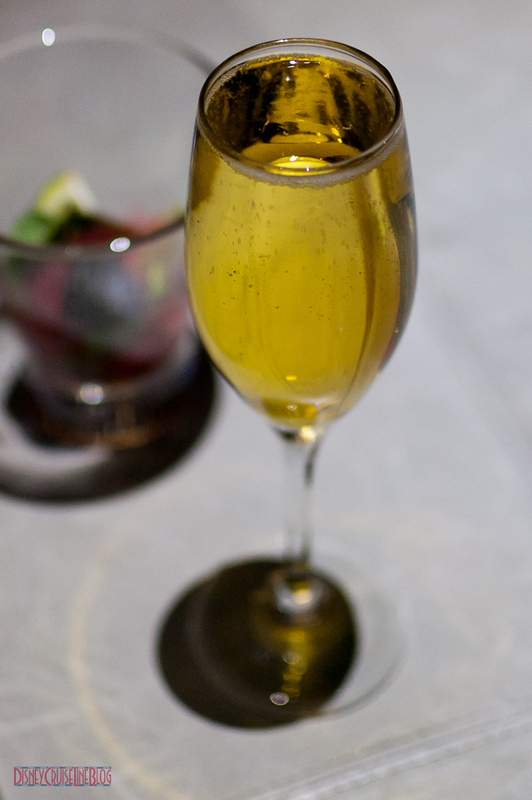 We were instructed to put some (not too much) Liqor 43 into the glass and then add Prosecco to it. This was another delicious concoction and we definitely plan to repeat this in the future at home! The next one was a Triple Berry Mojito. Novak wanted to teach us about muddling the fruit, and what that does. 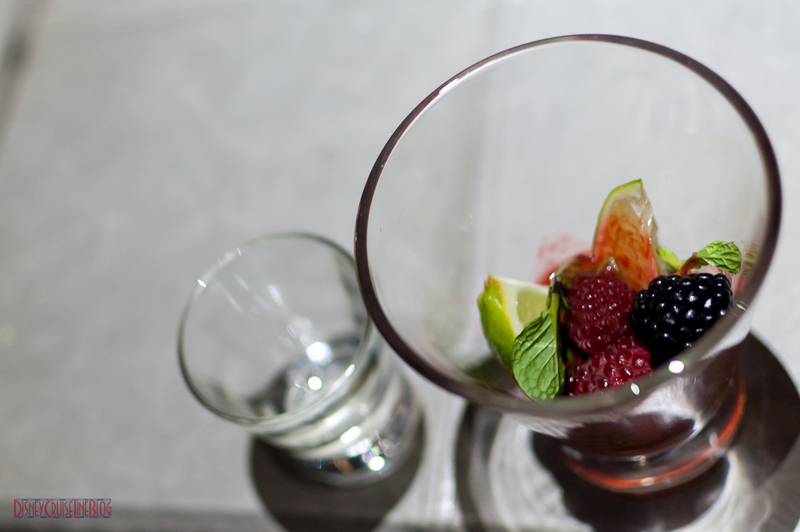 In our glasses were sprigs of mint, lime wedges, and raspberries, blackberries and blueberries. We muddled it all together and then filled the glass with Barardi O rum, which is rum with orange flavor. Novak gave my wife the full-sized version of this drink that he made at the bar. As you can see in the pic below, it was time to have a snack with these drinks, and we had the other gentleman in the bar working with Novak bring us some peanuts from O’Gills. The final drink was a layered shot comprised of Absolut Vanilla Vodka & Kahlua. Novak wanted to teach us how to do the layers correctly. 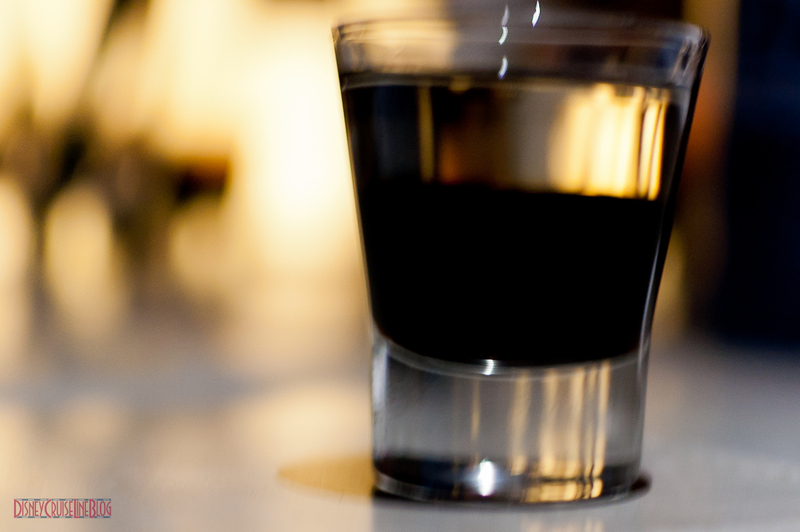 The trick to this shot is to slowly pour the vodka down the side of the glass to prevent mixing with the Kahlua, thus creating the layered look. 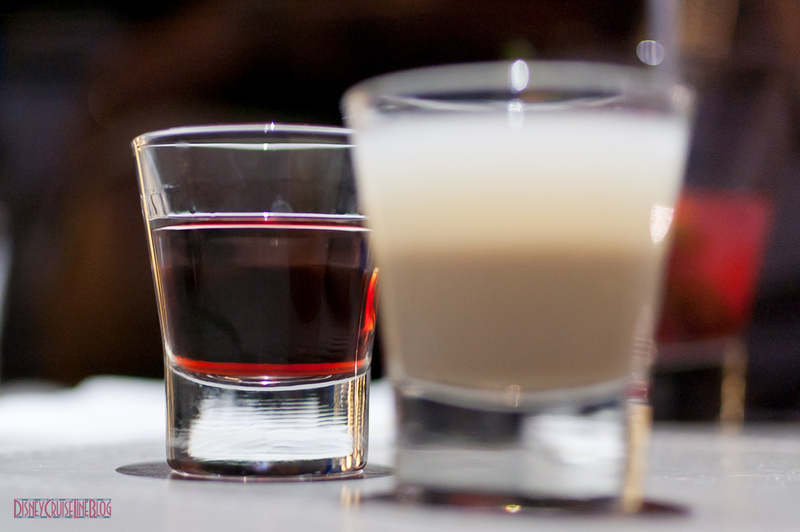 An alternate version of the shot was made using Absolut Vanilla & Baileys (pictured in the front). Although my pouring was not done as well as the first, you can still see the layers if you look close. Novak gave this shot to my wife as well. The layered shot in the back was vodka and either Chambord or something pomegranate, but I can’t recall exactly what he said was in it. This was enjoyed by one of our friends that was with us. Mixology is very reasonably priced at $15 per person especially if you consider what it would cost to order these drinks from the bar. This is a 45 minute seminar with 5 drinks and we highly recommend it. If it were not for the peanuts I requested from the Novak’s assistant bartender, I would have been hurting. Recently on our March 9-16 cruise on the Fantasy (although we did not do any of the tasting seminars), both Mixology and Champagne Tasting were sold out on the first day. 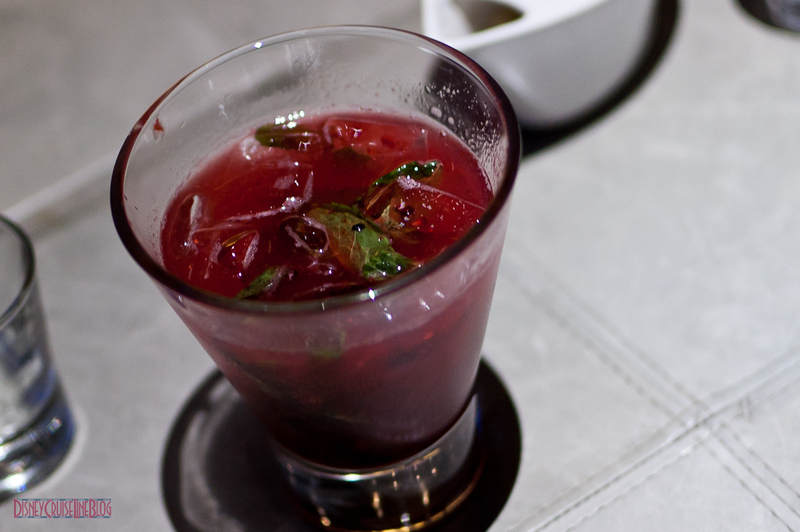 Therefore, considering the amount of passengers, I would suggest reserving your spot for Mixology (or any of the tastings you are interested in) as soon as possible on embarkation day. 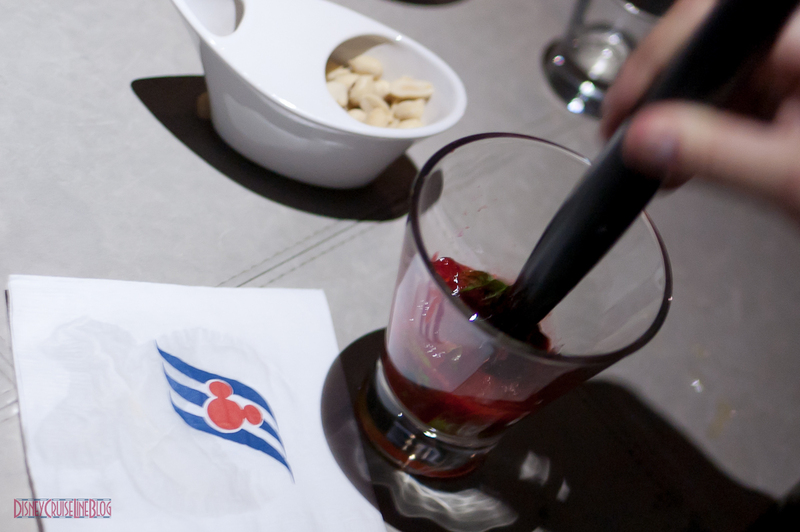 We are excited to try more of these tastings and even repeat Mixology on our future cruises. 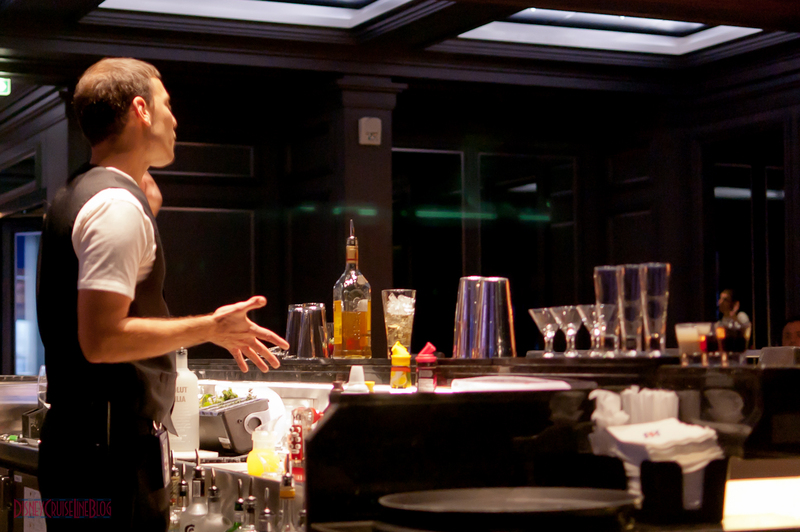 It is also important to note that no Mixology classes are alike; they may repeat a drink or two, but mostly the bartenders vary, as do the drinks and experience. This entry was posted in Trip Report and tagged Alcohol, Disney Fantasy, Liquor, Mixology by Scott Sanders. Bookmark the permalink. Scott – what was the name of that shot? Also, where on the ship do you sign up for this? Not sure on the name of the shot. You can sign up at La Piazza on embarkation day, then Guest Services. Love Novak! He does a great class. That looks really great. 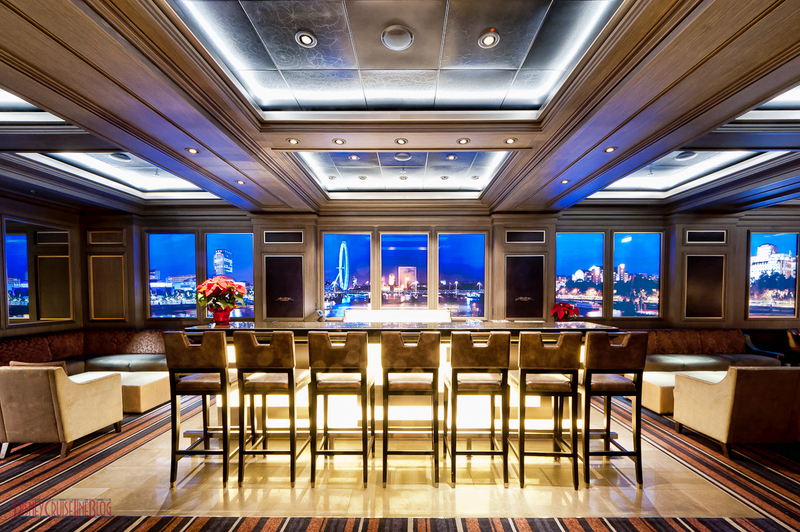 Last September we did the mixology class on the Wonder and that too was great value! No peanuts there though!!! The peanuts were not offered. I had to ask for them. Everything sounds great but they would have found my wife and I passed out at the bar if we drank this much. Maybe back in my younger days but I don’t think I could handle it now. I will say that price is really, really low for what you get. I think we paid that much just for the 2 drinks my wife and I had on our last cruise. I couldn’t agree with you more about the view at the Skyline. That is really neat how they done that. The location needs help though. It was not easy to find on the Dream and we actually just happened to wonder into it by accident.